I’m finally starting to recap my Miami trip! And exactly how does one tackle family beach trip in Watercolor and then Miami Swim Week without making the return flight home totally sunburned – especially when you’re skin is a light as mine was when you first arrive? In today’s post, I’m sharing the products I used to protect my skin and enabled me to go the entire week without one single burn on my face or chest. Before I start though, I just want to revisit the fact that I’ve already experienced the signs of early skin damage (you can see the post on my first sunspot here), so I’ve been SO much more careful when it comes to being exposed to the sun. 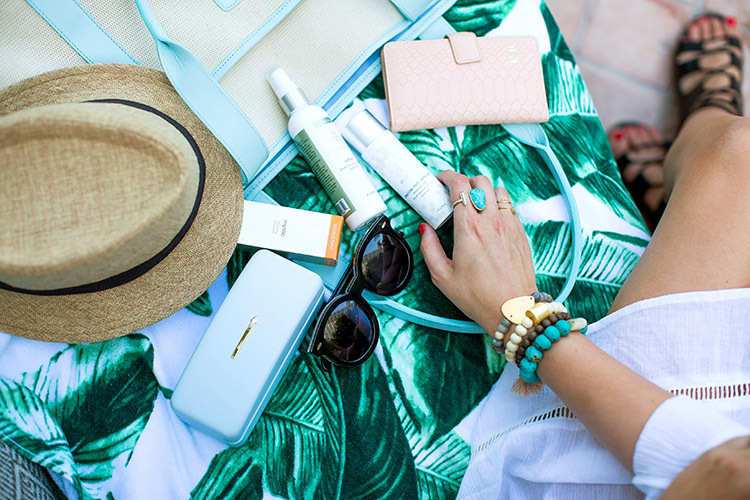 After finding out about CosMedix and the benefits of their new products dedicated to sun protection, I knew that I had found what I’d be packing along in my beach tote. 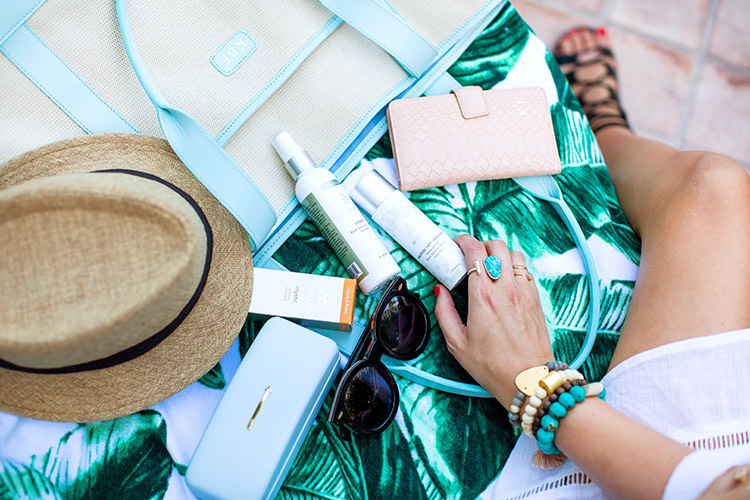 Take a look into my beach bag and learn more about which CosMedix products saved me during my beach travels in today’s full post! L*Space Seashore dress c/o / also love this one! I didn’t want to write this post right away because I’ve actually continued using the CosMedix Peptide Rich Defense product every morning since the trip, and I wanted to have a true opinion of this product by the time that this post hit the site. So what made me try swapping out my normal daily SPF products? So far, the Peptide Rich Defense has the same light texture that I look for in a daily moisturizer and SPF, but this one is SPF 50 (I normally go between 15 and 30 depending on the day) and includes peptides that fight against free radicals. I don’t get the major sunscreen-y smell or heaviness that you normally expect with SPFs that high either, and like I said, its super light, so I can still wear makeup over it without the greasiness. The second product is CosMedix Reflect which can be a full-body SPF 30 sunscreen. It comes in a spray bottle that’s ideal for spraying on shoulders, neck and chest if you’re heading off to an outdoor event – which we had plenty of while in Miami. This is the product to use when you need sunscreen on your body, but you don’t want to look or smell like you just applied drugstore sunscreen all over yourself. AND I love that it’s compact because you can even bring it with you if you want to reapply. It’s a super chic way to stay sun protected! Right after getting home, I took over the CosMedix Instagram account to document how I used these products on my trip – you can check it out at @cosmedix_! I’ve also been using some other CosMedix preventative aging products that I’m already loving. I just wanted to give myself a longer experience time before sharing. BUT there’s one that I’m SO excited to talk about it. It’s a major discovery for me! Stay tuned. Thank you to CosMedix for inviting me to take over their Instagram account and share my experience with these products through this post! You look incredible! Love this dress on you!